The Launch Pad: Only 3 Days Left to Register Your MoonBots Team! Only 3 Days Left to Register Your MoonBots Team! As of today, May 12th, there are 77 teams registered for the MoonBots Challenge. Teams from South Africa, Korea, British Columbia, Michigan, Illinois, South Dakota, Louisiana, Nevada, Rhode Island, Alaska, New Jersey and North Carolina have registered since the last Launch Pad blog post. This has truly become a geographically dispersed challenge and we here at the X PRIZE Foundation couldn’t be happier. We are also thrilled to see our Google Lunar X PRIZE Teams stepping up to the plate and volunteering to offer expertise to the MoonBots Teams as well as serving as mentors to the youth. In fact, Part Time Scientists, FredNet, Chandah, Odyssey Moon, Barcelona Moon Team and Next Giant Leap have all contacted us to show their support! It is fantastic to see the private space community and space enthusiast youth groups come together to support the Google Lunar X PRIZE mission. 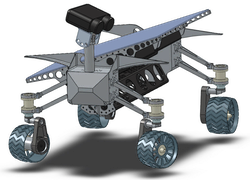 MoonBots Teams- Are you taking part in the MoonBots: A Google Lunar X PRIZE LEGO® MINDSTORMS® Challenge? Do you have a Moon or space related question that you want to be answered? Well, we can support you with your questions. We have created a new tab called Moonbots on our Part Time Scientists’ Facebook page. On this tab we will answer your questions. So if you are on a Google Lunar X PRIZE Team or are a space enthusiast interesting in the challenge and want to serve as a mentor to a MoonBots Team, there are only 3 days left to register. The registration form can be found on the MoonBots website. We are looking forward to seeing more teams register!